When the Fed ran out of luck! 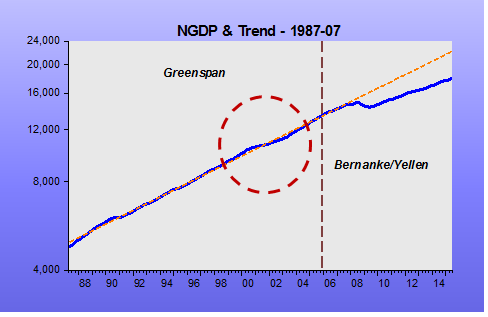 I think that coincided with Bernanke taking over from Greenspan. Let´s back track to a speech by Governor Laurence Meyer from June 2001, six months before he left the Board of Governors after serving for almost five years. 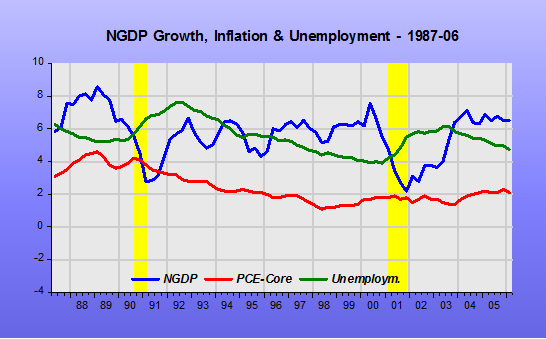 In 1995, the growth rate of the gross domestic product was close to the prevailing estimate of trend, the unemployment rate was close to the prevailing estimate of the non-accelerating inflation rate of unemployment (NAIRU), and inflation was modest. I am reviewing this bit of recent history just to set the stage for my arrival on the Board of Governors in mid-1996. What did the challenges facing monetary policy look like, and what did they turn out to be? The contrast is remarkable. When I joined the Board, the statement I made at my very first Federal Open Market Committee (FOMC) meeting was that, although economic performance had been very good–perhaps the first-ever soft landing–it would be a challenge to sustain that performance, and we certainly shouldn’t expect it to get any better. Without a doubt, that was my worst forecast. In fact, as you all know well, the economy’s performance did improve, dramatically, over the next four years. I have often described the ensuing reaction of the FOMC. First, we celebrated. Second, we gracefully accepted a share of the credit. Third–and in terms of time expended, this swamped all the others–we struggled to understand why performance had turned out to be so exceptional and what this explanation implied for the appropriate conduct of monetary policy. In the private sector, I learned that if you made a bad forecast, clients were more forgiving if, as a result, they ended up richer than they expected rather than poorer. So we struggled to understand the unexpected performance at the same time that we were accepting accolades for our contribution to the outcome, if not for our forecasting acumen. One reason that I am beginning with this nostalgia is to focus on the exceptional performance of 1996 through mid-2000 and take your minds off the more recent travails of the economy. 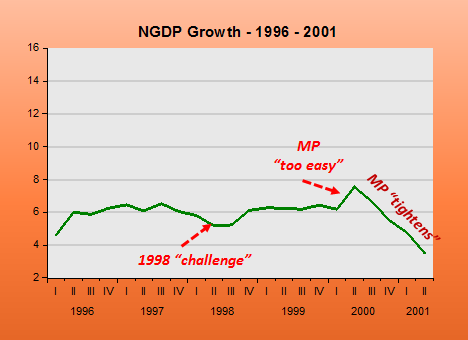 But I certainly understood that the time would come when monetary policymakers would find it challenging to keep the economy on a favorable course–as we had been briefly challenged in 1998. 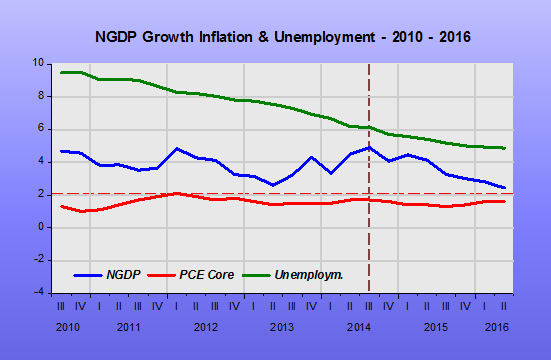 Indeed, last October, I said a transition to slower growth was likely already under way. 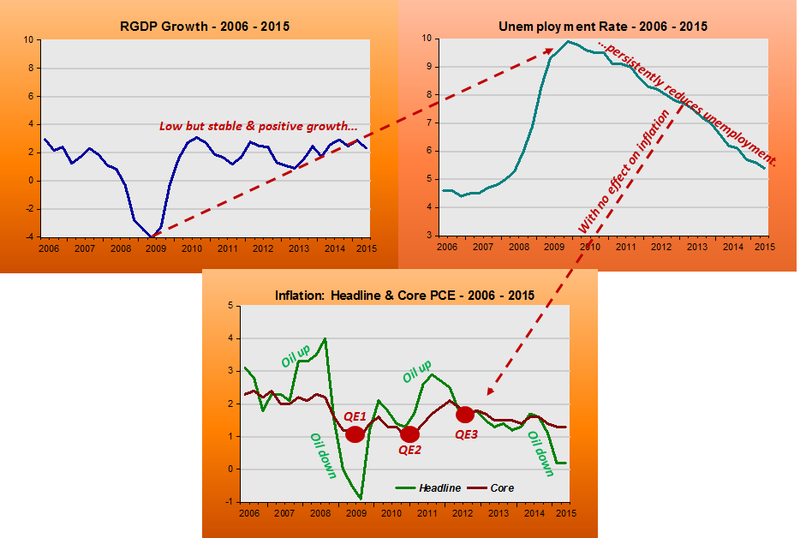 The charts illustrate the economy´s performance (in terms of real growth, unemployment and inflation) during the four years plus the “more recent travails” alluded by Meyer. 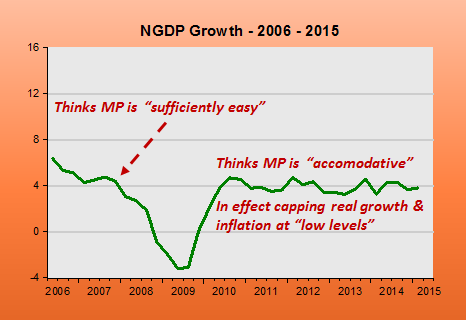 The next chart depicts the market monetarist stance of monetary policy (NGDP growth). 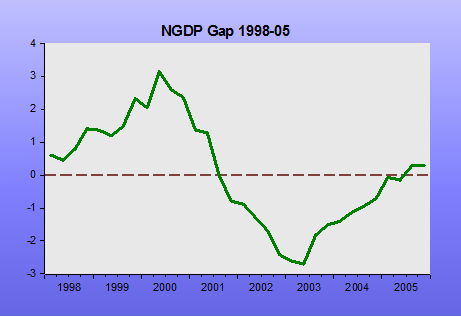 The 1998 “challenge”, for example, was the brief “tightening” of monetary policy reflecting the “Phillips Curve” view that above trend growth and below NAIRU unemployment called for “action”. Greenspan quickly reversed the “wrong” decision, claiming (correctly) that productivity had increased, something that pulls down inflation and increases real growth. Meyer (and the FOMC) thought they “got it”, but clearly didn´t, because a couple of years later, maybe reacting to the “tech crash”, they cranked up monetary policy. The increase in headline inflation was a reflection of the rise in oil prices (which had fallen considerably on the heels of the Asia crisis), while the rise in core reflected the monetary policy expansion. The consequent monetary “tightening” (despite the FF rate being forcefully lowered since early January 2001) was responsible for the “travails”! 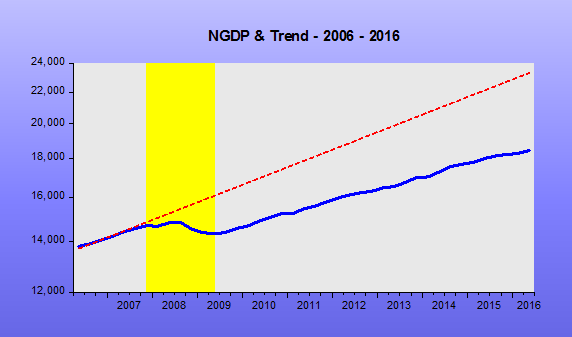 They never “guessed” that the nominal stability that prevailed was responsible for the good outcome (stable real growth, low unemployment and low & stable inflation). How did things progress to the end of Greenspan´s term? Things remained “bad” for another couple of years. 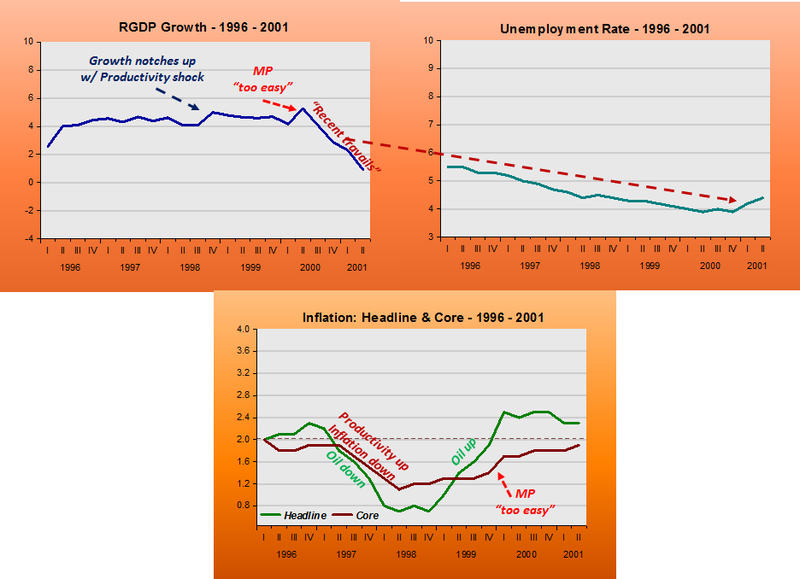 Real growth low (below trend), unemployment on the rise and inflation “too low”. Despite the FF rate being lowered to 1% the economy didn´t react. 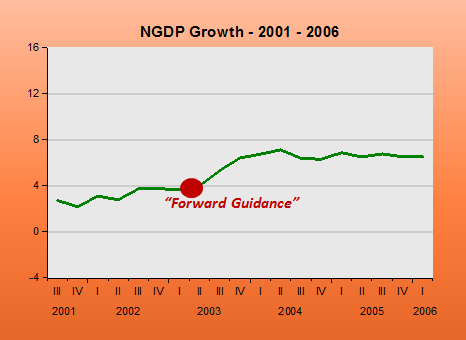 That changed when the Fed announced “forward guidance” in August 2003. 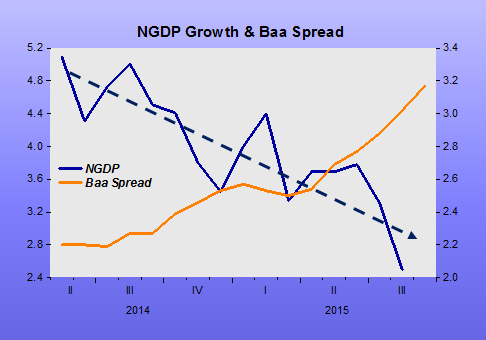 NGDP growth picks up, and so does RGDP. Unemployment begins to drop and inflation climbs back to “target”. His obsession with inflation targeting leads him to forget about overall nominal stability. 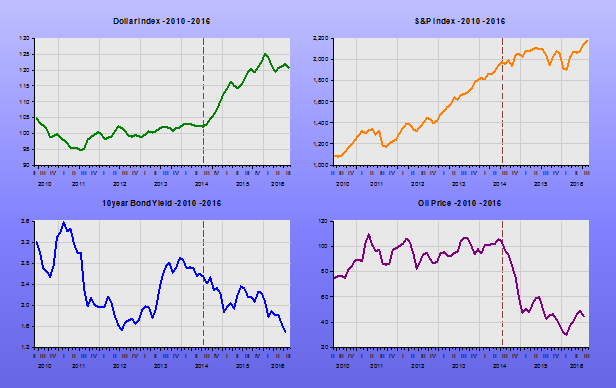 The Fed´s reaction to real (oil) shocks, in an environment weakened by financial sector difficulties, leads to an almost unprecedented drop in nominal spending (NGDP). 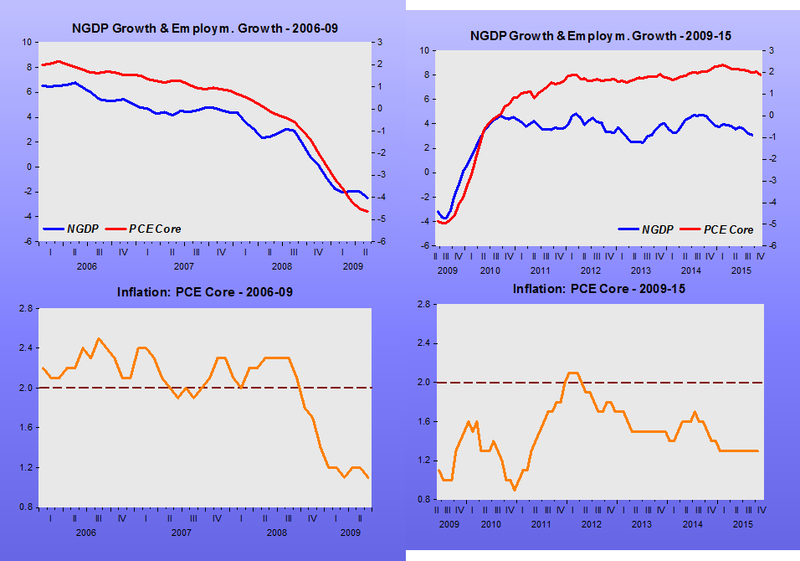 But the Fed feels it´s on “top of things”, never giving up its Phillips Curve/NAIRU “analytic framework”, and with unemployment falling persistently, there´s just no way inflation won´t soon begin the climb to the 2% “ceiling”! But that´s what they´ve been saying for more than one year, revising down their estimate of NAIRU as unemployment falls, first below 6.5%, then 6%, then 5.5% and now at 5.1%, even while inflation remains falling (at least “dormant”). Now we´ve had a rate hike “on the table” and “off the table” for several months. 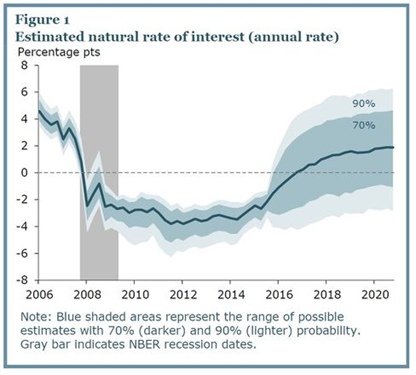 Our old friend from the Board Laurence Meyer, back as a private forecaster, calls the Fed to “pull the trigger”, which leads me to think he still “doesn´t get it”! Board Members show themselves to be completely at a loss. This recent interview by San Francisco Fed president John Williams is standard fare. The problem is that the Fed has for a long time shown that it has no idea about what would be best for the economy! 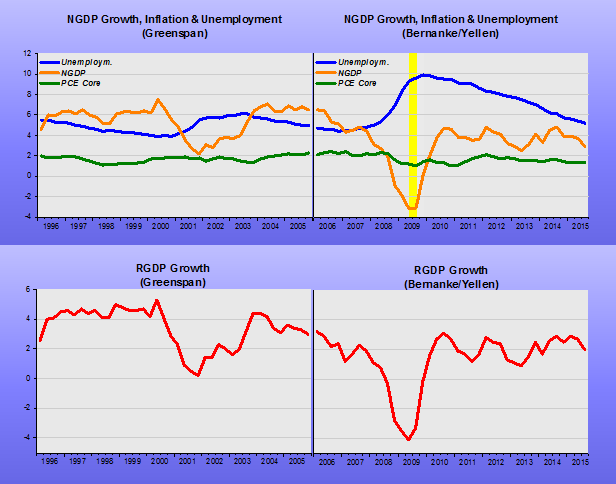 Since Bernanke began blogging I have complained that he doesn´t go to the “heart of the matter”. That is, recognize that the Fed, under his command, bungled. 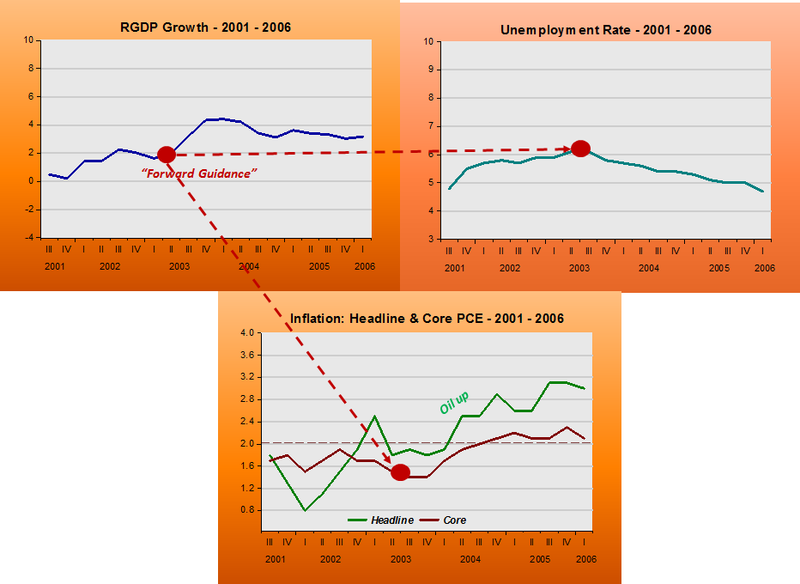 In fact, the mess-up is likely due to his “love affair” with inflation targeting, with that “love” manifesting itself at the worst possible moment, because the rise in headline inflation that occurred at the time was the result of a negative supply shock, which should not have unduly worried the “lover”. 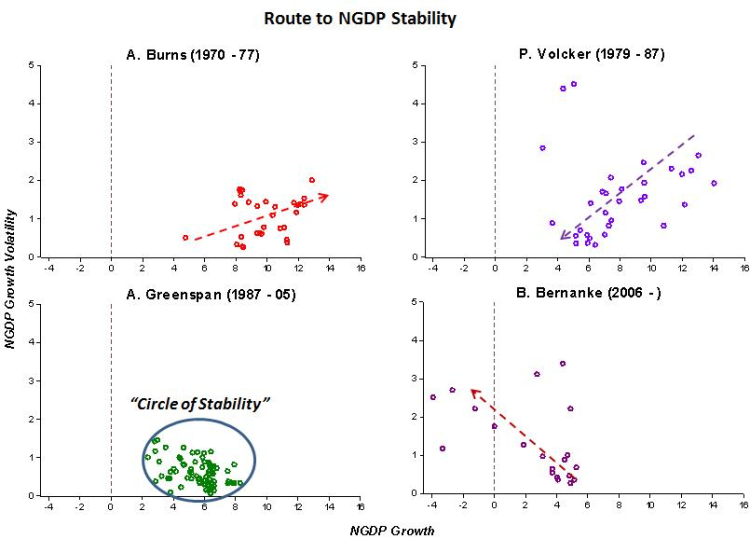 Bernanke has a deep knowledge of economic history, so he knew about the thought process on economic stabilization that evolved over the decades since the early 1970s. To recall, on becoming chairman of the Fed, Volker challenged the Keynesian orthodoxy which held that the high unemployment high inflation combination of the 1970´s demonstrated that inflation arose from cost-push and supply shocks – a situation dubbed “stagflation”. 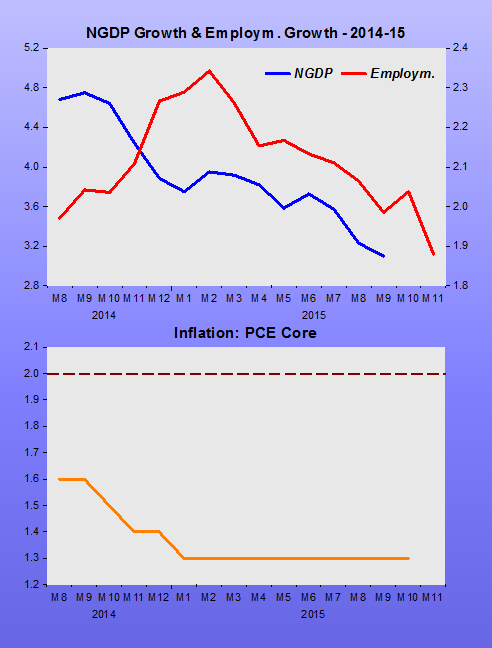 Volker´s challenge placed inflation as the FOMC´s top priority. He also brought to the fore of policy discussions the ideas developed during the previous 12 years – since Friedman´s address to the 1967 AEA meetings – on the importance of inflation expectations. To Volker, the policy adopted by the FOMC “rests on a simple premise, documented by centuries of experience, that the inflation process is ultimately related to excessive growth in money and credit”. This view, an overhaul of Fed doctrine, implicitly accepts that rising inflation is caused by “demand-pull” or excess aggregate demand or nominal spending. 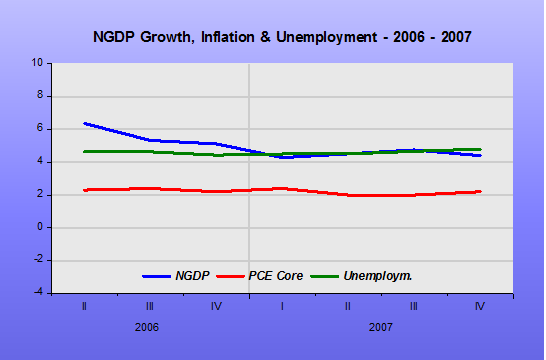 Now, why is this new “doctrine” consistent with the observed increase in economic stability? Given the cost-push “doctrine” on the inflation of the 1970´s, the Fed would compensate the fall in AS with an increase in AD, an expansionary monetary policy. This followed from the perceived flatness of the SAS curve below potential output. 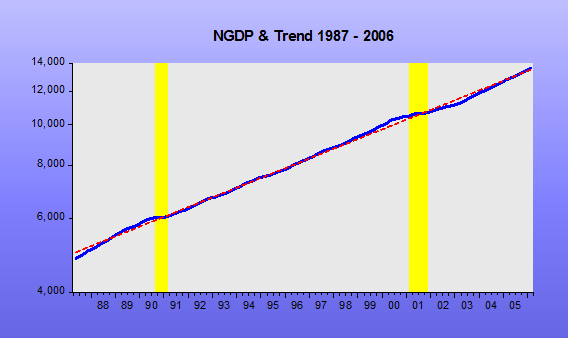 Since this was a flawed doctrine, over time we should observe trend growth in AD (or nominal expenditures). Volker, on the other hand, believed that inflation was the result of excessive AD. So nothing more natural than to assume that the Fed should increase its responsiveness to the growth in nominal spending. How would this change in “doctrine” (from regarding inflation as a “cost-push” to “demand-pull” phenomenon) show up in the data? Recall that under the cost-push “doctrine” the Fed would react vigorously to negative output gaps making policy expansionary, so nominal spending would grow. Under the new “doctrine” the Fed doesn´t react much to supply shocks since a negative supply shock, for example, would decrease real output an increase prices with little effect on nominal spending, but would react vigorously to AD or nominal spending shocks. Therefore, under the new “doctrine”, policy would make AD growth stationary, in which case AD growth will not show a rising trend as under the cost-push “doctrine”. The chart illustrates. 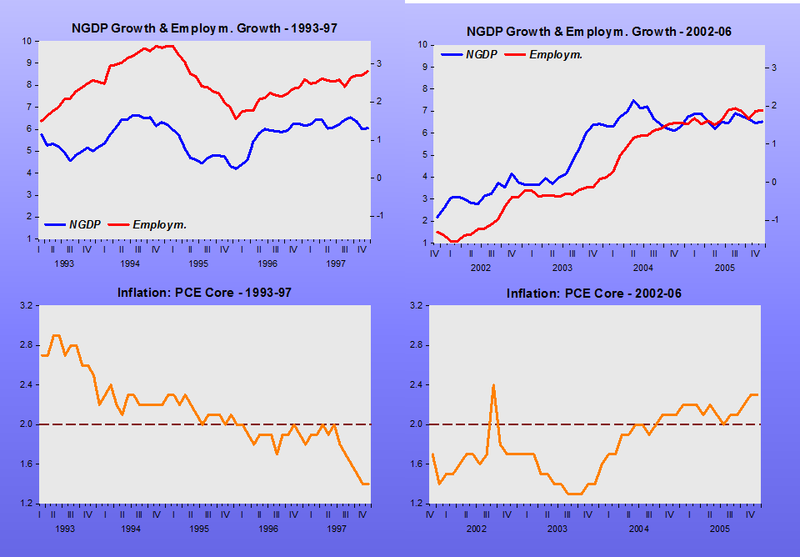 The main difference between the two “doctrines” is not the change in the Fed´s responsiveness to inflation as argued by, among others, John Taylor and Bernanke, but the changed responsiveness to aggregate demand or nominal income growth. A collateral effect of the change in “doctrine” shows up in the reduction and stabilization of inflation and decreased volatility in real output. 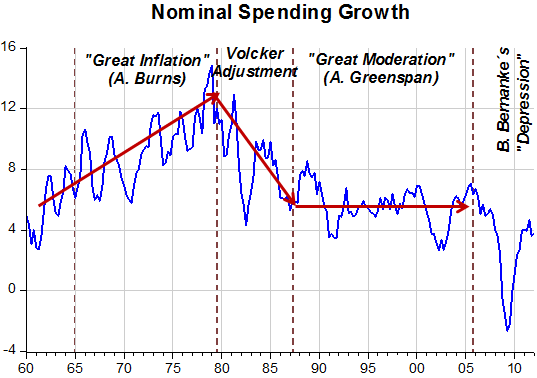 The Fed never explicitly targeted anything – inflation or nominal income (AD) growth – but implicitly you could say it targeted nominal AD along a 5.5% growth path growth with Volcker and Greenspan. The chart below provides, to my mind, compelling evidence about the change in doctrine and its stabilizing consequences. 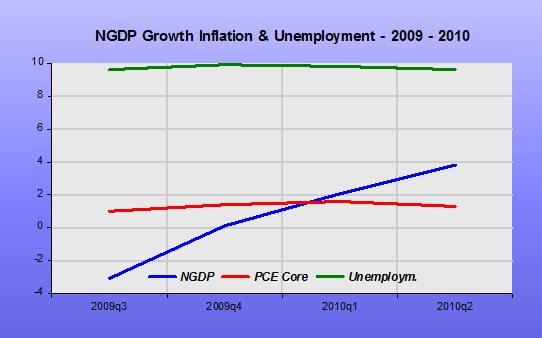 One implication is that during all this time, “Inflation Targeting” was just a red herring! 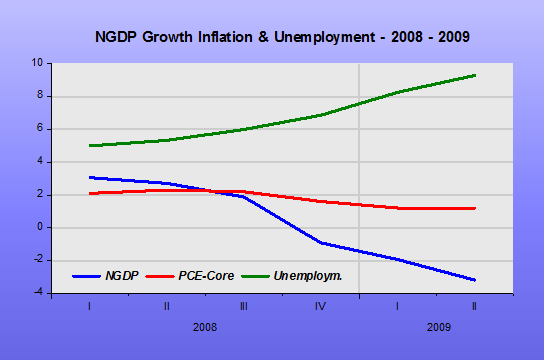 And the biggest victim of the “red herring” was Bernanke himself. Since forever he has been a great defender of the “IT modus operandi”, and exactly when he put it in practice he “pushed the car off the road” and got a “depression” as the result. Later, by making the “red herring” @2% official policy target, he showed he was clueless about the true cause of the monetary policy foul-up! But does this say anything about the presidents in question? Both the Reagan expansion and the Clinton expansion had much more to do with Federal Reserve policy than anything coming from the White House, and Obama’s macroeconomic policy has been hamstrung by GOP opposition almost from the beginning. There are presidents, and sometimes there are job booms when they are president, but the booms aren’t their doing. If the Reagan and Clinton expansions had much more to do with Volcker and Greenspan, why not conclude that the dismal Obama economy has much more to do with Bernanke and Yellen than with “Obama´s macroeconomic policy being hamstrung by the GOP opposition”?